Winter bass fishing is not for everybody. 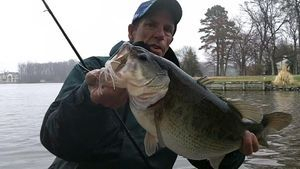 You will not catch large numbers of bass most of the time in winter, but... you can catch some of the biggest bass you will catch all year, especially in late winter to early spring, in the northeast, when water temperatures are in the low 40's to 50 degrees. During this time Big Swimbaits, the JIG, and crankbaits on selected days and areas can produce some GIANT bass! The jig by far outproduces most baits for winter bass except during select times of the day or during a warming trend and the crankbaits take a close second. There are some specific techniques for these baits that you can really only learn by being there on the water, but the videos show as much as possible on how to catch these bigger bass on crankbaits and jigs in the winter. The shallow crankbaits have taken many a tournament limit and big bass in the Northeast river in the winter by bouncing them off dock posts pilings and shallow submerged older sea walls,docks and rocks. The swimbaits such as the Huddleston take GIANT bass but they are bait of a thousand casts many days.